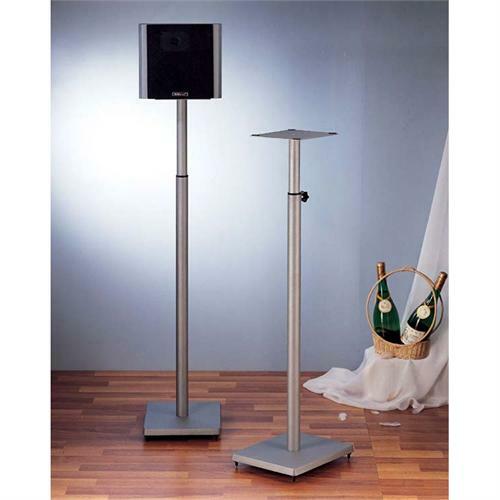 More on the VTI BL Series 34-59 inch Adjustable Height Speaker Stands (Silver) BLE101S below. Call a VTI AV rack specialist at 1-800-807-1477. All metal construction with cast iron base for long lasting display. Adjustable spikes keep unit level on carpet or hard floor. Adjust height from 33 3/4 in. to 59 in. for surround sound speaker. Spiked feet and top pad to secure speaker are also included. Footplate discs are included for hardwood floors. Available in black or silver finish. Height: 33.75 - 59.00 in.